It is a material that is warm to the touch and similar to natural stone. 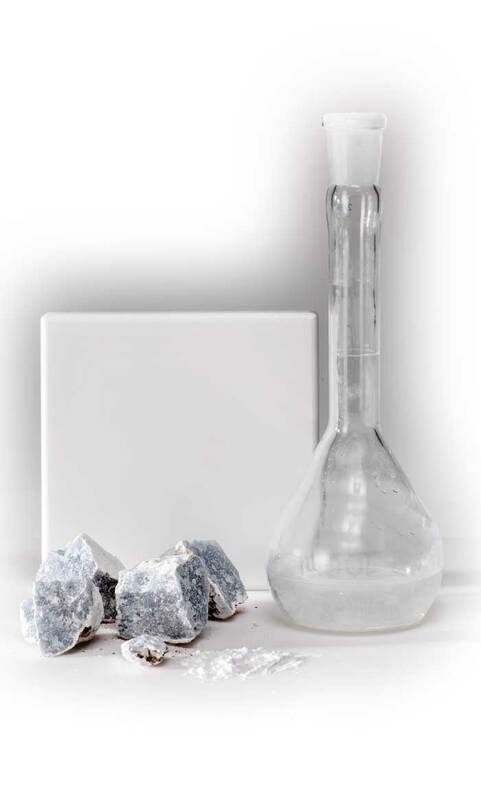 It is made of two-thirds natural minerals (ATH – Alumina Trihydrate) and a low percentage of high-resistance resins. This composition gives KRION™ a number of exclusive features: it does not have any pores, it is anti-bacterial without any type of additive, it is hard-wearing, highly resistant and easy to repair, only requires minimum maintenance and is easy to clean. It is cut in a similar way to wood, allowing us to cut the sheets, connect them and thermoform them to create curved sections, and can even be injected during the production process, making it possible to create different designs and projects that are impossible to achieve with other materials. Seamless sections can be created, preventing liquids from being absorbed and making cleaning and maintenance easier. We offer a wide range of colours, including a white finish that stands out for its purity and neutrality in comparison with other similar material. It is an ecological material, as it is 100% recyclable. All products made of KRION™ can be reprocessed and reused in the production cycle.